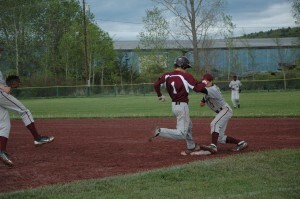 Whitehall’s baseball team squared off against two of the Adirondack League’s best teams and its worst, and a seventh-inning rally was the only thing that prevented the team from finishing the week 0-3. On Friday, the Railroaders hosted Argyle and the last-place Scots gave the Railroaders everything they could handle. Trailing 7-6 entering the seventh inning, Whitehall scored 13 runs, its most prolific inning all season, to earn the 19-8 victory. Although the game was played in Whitehall, Argyle was the home team because their field wasn’t suitable for play. Dillon Griffin picked up his first win of the season in a complete game effort, and helped his own cause with three hits and two RBIs. Carl Rehm scored three runs, Justin Hoagland was 3 for 6 with a pair of doubles and two RBIs, and Josh Hoagland had four RBIs on two hits, including a two-run home run. Riley Schmaler led Argyle with three runs, a double and a home run. Argyle held Whitehall scoreless for the first two innings and took an early 3-0 lead in the second inning. The Railroaders scored four runs in the third inning but Argyle answered back with three more runs for a 6-4 lead. The Scots added another run in the fifth and Whitehall added two more in the sixth to set up the rally in the final inning. On Monday, the Railroaders hosted a Salem team that had lost two league games all season and the Generals offense proved to be too much for Whitehall as they lost 19-6. Salem totaled 16 hits and scored a run in every inning, including four in the first, third and seventh innings. The duo of Kris Payne and Nick Burch combined for eight hits and nine RBIs for Salem as they sent Rehm to his first loss of the season. Whitehall also dropped a close contest to Adirondack League West Division champion Lake George last Wednesday 3-1. Connor McCoy allowed six hits and stuck out 10 for Lake George. Brett Christian was nearly as good, holding Lake George scoreless for four innings and allowing only eight hits. Griffin recorded two hits for the Railroaders, and Paxton DeLorme and Josh Hoagland each stroked doubles. Hoagland scored Whitehall’s only run in the first inning and Christian was cruising along until the fifth inning when Lake George plated a pair of runs. They added a third run the following inning. Whitehall is now 9-6 and in third place in the East division. They have already qualified for Sectionals and should learn their opponent next week.